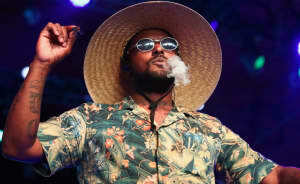 ScHoolboy Q has received an apology from United Airlines after his dog was mistakenly put on a flight to Chicago. The TDE rapper hit out at United on Friday, tweeting: "You guys r idiots @united HOW U PUT MY DOG ON THE WRONG FLIGHT???? I need answers." CNN reports that Q was traveling with his dog, Yeeerndamean, from Missouri to Southern California, with a layover in Denver. However, when he got to Burbank, north of Los Angeles, he was alerted to the have that his dog had been mixed up with another in Denver. As a result Yeeerndamean was more than 2,000 miles away, in Chicago. Thumbnail image via ScHoolboy Q's Instagram.